Final Round experienced some heavy downpour early in the morning. The tee-off time then being delayed for 1 and half hour. First group teed-off @ 9:00 am. 22 played Under-PAR (20 played TOTAL Under-PAR). 6 played Even-PAR (3 played TOTAL Even-PAR). 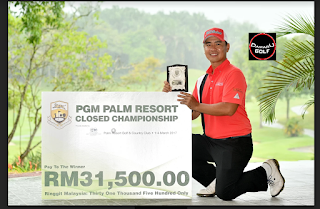 64 (-8) Khor Kheng Hwai - 8 Birdies, Bogey free round. 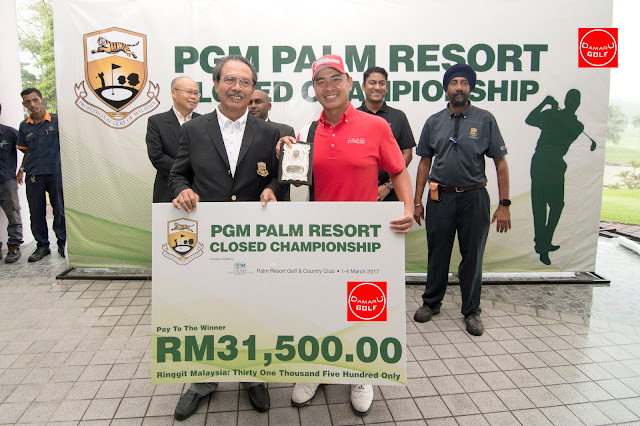 From left:- Mr Jef Kong (CEO & General Manager of Le Grandeur Palm Resort Johor - Palm Resort Golf & Country Club); Nik Mustapha Nik Mohamed (General Manager, PGM); Mr. Malik (Golf Manager, Palm Resort Golf & Country Club); Khor Kheng Hwai (CHAMPION - PGM Palm Resort Closed Championship 2017); Mr. Damien Kumar (Assistant Director of Sales, Le Grandeur Palm Resort Johor); Mr. Harbans Singh (Tournament Director, Pgm Palm Resort Closed Championship 2017).